Potatoes are what made us fanboys of this whole lost line of cookware. A friend of ours, upon cooking potatoes in his Guardian Service Economy Trio cooker for the first time, called us to say he couldn't believe the flavor—"I can taste the Earth!" he gushed. So you can. Keep the skins on. 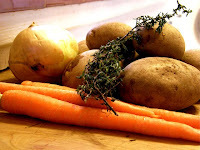 (As with most vegetables, but especially true of potatoes; so much of their nutritional value is in that precious skin). Shake the roaster a couple of times during cooking to let the potatoes re-position themselves, and they'll all brown nicely. Try for a happy medium: a few crisp, golden edges, and flaky mealy insides. A little bit over a half hour of cooking time seems to hit it just right, depending on how many potatoes and how big the chunks are. It’s nearly impossible to overcook potatoes in GS. I once left the roaster on, very low of course, and forgot it for several hours... Instead of being ruined, the potatoes were mealy and ambrosial (though the caramelization on the pan was thick and took some soaking to get out. A little caramelized goodness is a beautiful thing but avoid burning, which produces potentially carcinogenic acrylamides... besides being no fun to clean). Scrub the potatoes, place in cold unit. Cover, start over medium flame for 5-7 min. or until cover of unit is quite warm to touch. 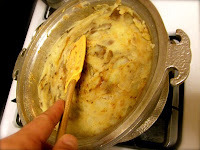 Reduce heat to low until potatoes are tender. 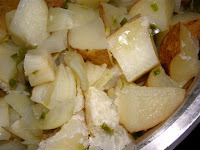 Baked: When potatoes are softened, pierce skins several times with a fork or cut crossed slits on one side. Leave unit over a low flame with cover partially open 7-10 min. to allow surplus moisture to escape. 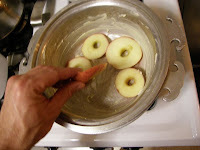 Since Waterless Cooking works like a pressure cooker (only slower), you can work magic with foods which readily absorb flavors (like the humble spud). 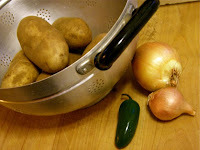 Add chopped cloves of garlic (or an onion, or shallot... or jalapeno if you'd like some added heat) in with cubed potatoes and cook them all at the same time. 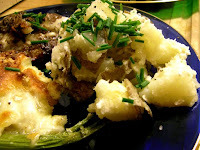 When potatoes are done, turn off the heat and add a pat or two of butter (or cream cheese, milk, cream, yogurt or sour cream) and fresh herbs (parsley, chives, rosemary, savory, dill, whatever suits your taste). Stir and let sit for a moment with the lid on to let the flavors marry. Finish with freshly ground pepper and a nice salt, garnish and serve. 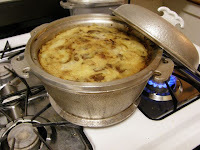 If there’s anything left over: re-heat the mash the following morning (I like to use the Duplex Utility (omelet) pan, heat them up, shift the mash to one side and cook up some eggs in the other). Very little fat—the tiny bit you added just after cooking—goes a long way! 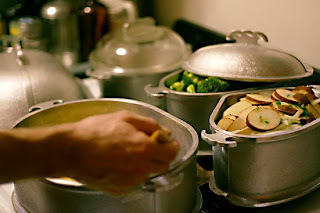 Of all the food we prepare with our Guardian Service cookware, vegetables shine—literally. The superior color and texture of vegetables prepared “The Guardian Service Way,” are a result of the nutrient-retaining method of waterless cooking. Of course, the real beauty is that those vitamins and minerals, which would go up in steam or down the drain in other cooking methods, will instead nourish you and your beloveds. “Waterless” doesn't mean no water at all—in fact what you actually are doing is super-heating the water within the food itself as pressure slowly drives heat into the cells of the food, vaporizing its own juices. 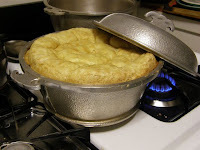 In brief, the technique is to get your Guardian Service pan hot at first to encourage steam, then turn the heat down to cook gently. 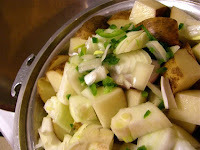 Water vaporizes inside the vegetables’ cells, which stay intact, and every bite is delicious and nutritious. First, clean and prep your vegetables, but with most, avoid peeling: it requires more scrubbing, but it preserves so much flavor and nutrition—another argument to buy organic produce when you can. Remember that the finer something is chopped, the quicker it will cook. You can bake whole potatoes in GS (and they are spectacular) but to speed up the process, chop them—true for parsnips, carrots, turnips, beets, any of the starchy vegetables. When we want it fast, we chop it fine, but if we’re not in a hurry, we quarter them or chop them in half and let them linger on low flame for a bit longer. 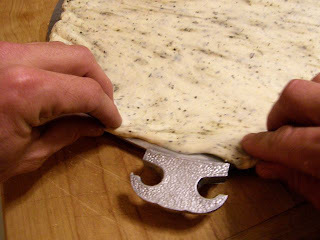 Cover unit and set over medium heat for 5 minutes or until the lid is warm to the touch. 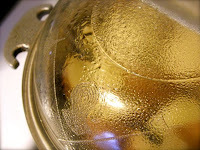 Within minutes you'll see steam rolling down the inside of the glass lid like a delicious science project. Now turn the heat way, way down, until (if you’re cooking with gas) the flame is barely flickering. Check for doneness after 15 minutes or so, depending on the vegetable. You may wish to add a pat of butter and dash of salt, then stir or shake and serve (right in the unit—another economic benefit: each Guardian Service piece is designed to go from stove to table-top, so there are fewer pots to clean). We typically reserve organic vegetable scraps in a freezer bag, then cook them down into soup stock when we have a surplus. 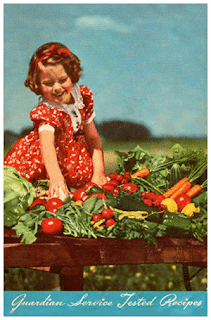 But some trimmings can be profitably cooked right along with your vegetables. For example, broccoli: instead of throwing out the woody stalks, lay them at the bottom of the pot, then layer the broccoli florets on top. As you cook them together, the stalks will protect the upper florets and suffuse them with extra moisture, flavor, and even vitamins. 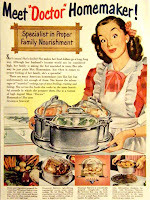 Guardian Service is Depression-era cooking not only because of the conservation of nutrition but because it is incredibly frugal with carbon (meaning heating energy, whether gas or electric). Aluminum is highly efficient at conducting and retaining heat, and when the amount of heat that is streaming into the pan from the burner equals the amount of heat radiating off the outside, your food cooks at its ideal temperature. The technique “slow cooks” your food (but quickly!) with the heat that is initially built up inside the metal. It's common sense: keeping the lid on conserves heat and moisture. You may have noticed the succulent aromas sealed inside the lid, which only escape when you lift it. This is key to flavor—aromas are flavor essence, and scents that are in your kitchen, delightful as they may be, are in the air, not in your food. Wash vegetables carefully, even though they look clean. 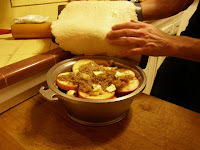 Scrub, remove only decayed portions and tough outer stalks or leaves as necessary. Remember, when you are tempted to peel—vital food values are wasted in parings. 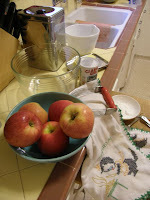 A wire vegetable brush is less of a culprit than the paring knife. Select a GUARDIAN SERVICE unit that corresponds in size to quanity of vegetable. Place in unheated unit. If vegetables are not strictly fresh or if, when peeled, some of the natural moisture has been removed, then replace moisture by adding a very small amount of water. This also applies in the case of preparing a small quantity of food in a large unit, there being insufficient moisture in the food to fill the unity with vapor. Cover unit and start over MEDIUM HEAT. Never use high heat. Heat will spread evenly and quickly to every part of your GUARDIAN SERVICE unit. Too much heat at first may cause food to stick before vapor has formed with unit. Keep on MEDIUM flame about 5 minutes, until cover of unit becomes quite warm to touch. Reduce heat to LOW. Do not wait for vapor to escape before reducing heat. Escaping vapor, at any time, means that flame is too high. Low heat will be as easy on the vegetables as on the fuel bill. Season any time after vapor forms. Because rich, natural mineral salts and juices are largely retained, very little or no seasoning is required. 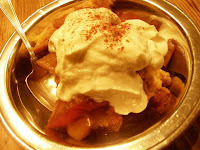 The addition of butter just before serving is sufficient in most cases. Never, never add soda to vegetables as it not only gives them an artificial appearance, but actually breaks down the fiber and destroys flavor and vitamin content. Avoid lifting covers unnecessarily during preparation period as this prolongs time and allow vapor to escape. Raising the heat will not speed up the process, and may cause food to dry out and stick or burn. 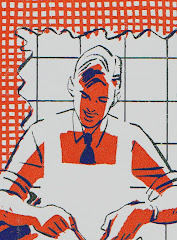 Test for tenderness at end of preparation period (See time chart, page 9.) 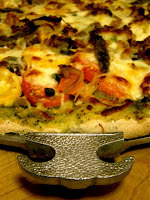 Vegetables are done when tender, but still firm and natural in color. Do not soften to mushy, breaking apart stage. 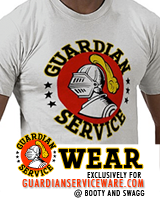 GUARDIAN SERVICE is constructed to retain heat over a long period of time. Therefore to prevent loss of color through over cooking, remove cover from the following vegetables as soon as tender: Asparagus, broccoli, brussels sprouts, green beans, peas, greens, cabbage and cauliflower. We first stumbled upon a Guardian Service coffee pot in a Burbank thrift store going out of business, victim of the recent depression. The bullet-proof, vaguely aeuronautical design snared us first, but the more we researched, the more impressed we became by the esteem in which this long-defunct brand has been held by generations of chefs and nutritionists, and by the part it played in the evolution and spread of “California cooking”—meaning modern, healthy, diverse, fresh, and holistic in the post-War period. 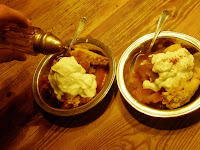 We've since been cooking most every meal with the cookware and are always researching and improving our techniques. 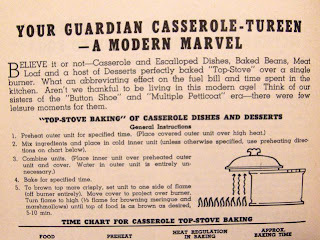 We're always impressed by the versatility of the cookware and the economy of energy it uses, but above all the flavor of foods prepared "the Guardian Service Way." Whether you are new to Waterless Cooking or an experienced enthusiast, we hope that the ideas and recipes presented here will help you get the most out of your Guardian Service cookware in pursuit of "Good Health, Pleasure and Profit."